LIFE HACKS #1674 WAKE UP WITH A SORE THROAT? MIX HOT WATER, - ProudMummy.com the Web's Community for Mums. 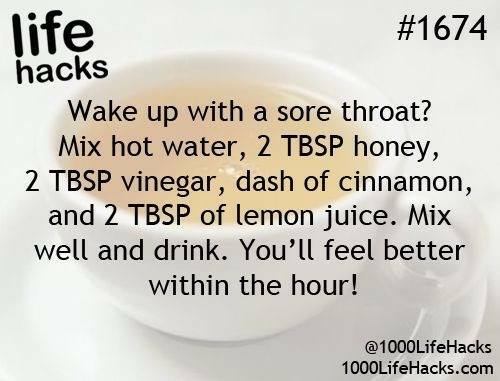 LIFE HACKS #1674 WAKE UP WITH A SORE THROAT? MIX HOT WATER, 2 TBSP HONEY, 2 TBSP VINEGAR, DASH OF CINNAMON, AND 2 TBSP OF LEMON JUICE. MIX WELL AND DRINK. YOU'LL FEEL BETTER WITHIN THE HOUR!